Welcome to our "Made in Montana" handcrafted wooden toys made for toddlers and children of all ages. Dry Gulch Gifts manufactures and distributes nostalgic and humorous novelties and gifts. Eta Toys design and distribute toys that stimulate creativity with future in mind. We believe what our kids play with today has a major influence on who they become in the future. Our business is built around this philosophy by fostering playing experience that drives creativity with Simple, Natural, Humane, Free Thinking, and Fun toys. German Entry LLC, is an importer and distributor of exceptional, high-quality, safe and beautifully manufactured children's toys from Europe. 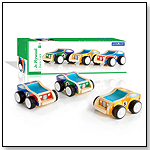 Goki wooden toys are well known in Europe for their high-quality at affordable prices. Lovingly crafted functional design and contemporary colors are the distinguishing features of the brand. Good wooden toys are essential for children in the development and retention of motor, sensory and tactile skills. Since 1964 Guidecraft has created products for children with a focus on safety, creativity, quality and durability. Looking for products that are fun, engaging and also responisble?Welcome to Hatched Egg'rs, a one of a kind Kid's Decor company. Hennessy horses makes fine quality hardwood rocking horses. Holztiger wooden figures are handcrafted in Europe. There are several hundred styles in a wide range that includes farm and domestic animals, zoo and jungle animals, forest creatures, dinosaurs, trees, fairy tale characters, medieval play, and nativity figures. GREAT NEWS FOR JIGSAW PUZZLE ENTHUSIASTS! Here's the product you've been waiting for. Jonti-Craft, Inc.® is the leading manufacturer of high quality early learning furniture made from wood and laminate. Recognized and approved in schools and museums throughout Europe, Kapla is an outstanding learning tool for individual as well as group play, enhancing multiple intelligences, cooperative and differentiated learning and hours of building creation. Our goal is to inspire children with the power of their imagination through unique and creative heirloom-quality wooden toys and room furnishings. Award winning, artfully designed blocks and construction sets. Liberty Puzzles are classic wooden jigsaw puzzles, made with real, quarter-inch maple veneer plywood and the finest archival papers and inks. MagnaPlay™ strives to manufacture creative magnetic activities that will enable children to learn while having fun, anywhere, anytime. For over 60 years, the Ostheimer Company of Germany has been handcrafting a unique line of wooden toys designed to stimulate a child's imagination, and teach creativity through play. Newartifacts is a project of a group of artists, designers and entrepreneurs from Uruguay, South America that envision integrating art into daily life while transforming life into an art. We develop and create unique artifacts, with the intention to generate original perceptual experiences. Based in idyllic Byron Bay, NSW Australia, O.B.Designs was birthed in 2008 by Kate Nicolson & Leesa Hallahan. We produce unique & stylish toys with a dash of Vintage Flair & Funky Edge! Play Smart has a line of all new unique, brightly colored educational toys designed to give children endless hours of creative fun. Puzzled, Inc manufacture and wholesale wooden toys, 3d puzzles, Gifts, and Souvenirs. Robbins Toy, a toy-making division of Robbins Lumber a family owned fifth generation Maine Company. The Sküüt is a wooden bike for children ages 2 - 5. Stuhr Products is a family owned business run by Ed and Katherine Stuhr. TAG Toys are proudly designed and made in the USA. Tatutina, a 20+ years company that began in the basement of a home in Massachusetts, is a family, woman owned and operated business with a passion to paint colorful and fun products! Top Shelf manufactures and distributes two specialty lines of wooden toys - iggiBig and Heritage Playsets. Westwork Designs was created for children who aspire to build and builders who aspire to be children again. Westwork Designs blocks aren't your ordinary dime-store blocks. Woodland Magic Imports is the exclusive North American distributor of Woodman Concept woodworking project kits and carpenter cases for children. A TOYDIRECTORY member since 2003, the Woodstock Music Collection® focuses on making the very best sounding instruments available to help kids of all ages discover their inner creativity.